In Florida, a property owner who hires a person to work on the property owes a positive duty to said person to provide them with reasonably safe instrumentalities and a safe place to work. An employer has a duty to use ordinary care and diligence to keep the workplace safe, taking into consideration the exigency of the circumstances and the character of the work to be done. In 2010, our client, John Doe (“JD”), was employed and working as a handyman on a private property in Key West, Florida. Part of JD’s job was to climb up a ladder and trim trees on the private property. In ordering so, under Florida law, the property owner had the duty to provide JD with everything necessary to do the job safely, but he failed to do so. When JD was sent up the ladder to cut the branches of a large tree, the property owner failed to secure the ladder, either by hiring someone to help steady the ladder or providing a ladder stabilizer to assure the safety of JD. Instead, the ladder slipped while our client was cutting the tree and JD fell on his neck from 15 feet. Our client is now a paraplegic. At age 52, he cannot move his legs, and will never be able to walk or work again for the rest of his life. He has no control over his bowel and bladder. He has no sensation below his chest. After litigating this matter for over a year, Thomas Scolaro and our team of Florida Personal Injury Lawyers reached a multi-million dollar recovery on behalf of our client. Today, JD lives at home in Key West where he is financially able to afford medical care and assistance on a daily basis, which he will need for the rest of his life. In JD’s case, the property owner was the responsible party and ultimately settled out of court, but most ladder-related accidents are not attributable to the negligence of a third-party. A recent study published in the American Journal of Preventive Medicine has shown that between 1990 and 2005, more than 2.1 million individuals were treated in U.S. emergency departments for ladder-related injuries. This is the first U.S. study to use national data to comprehensively examine non-fatal ladder-related injuries. 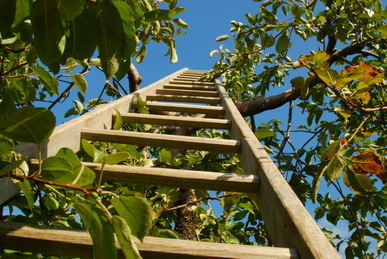 The results of the study which covered a 16-year period have shown that the number of ladder-related injuries increased by more than 50 percent, and that nearly 10 percent of injuries resulted in hospitalization or transfer to another hospital, approximately twice the admission rate of consumer product-related injuries overall. If you have sustained injuries in a ladder-related accident, contact our Florida Personal Injury Attorneys today at (800) 836-6400. Leesfield Scolaro has served injured individual in Key West and across the state of Florida for 35 years.